The Golf Course Guide has always been a good publication. With details on over 600 courses and great discounts and deals to entice players. When I opened my emails earlier today and saw they have launched an App, I was straight in there! The guide can be downloaded for phones and tablets (although it did tell me it was not compatible with my Samsung Galaxy Tab 3!). I downloaded it to my phone and, hey presto, access to all the contact details and course information any golfer would want. How good are mobile Apps? You can search by Name, Nearby Map, Nearby List, Australia Map and even their own rankings list. I really like the ease of being able to simply click on a link to see the clubs website or even make a call to book right there and then. Best of all the App is free! Yes free, and if you download the App and like their Facebook page they will send you a free copy of the book (for a limited time) so you can enjoy those special offers and discounts. All you have to do is pay the postage cost (for me $6). For further details go to Ausgolf. If on a mobile device the special offer will display. Not to sure how long this offer will last so be quick. To some it may seem a little silly to review a glove, but to those out there who really appreciate performance and feel and understand what a glove can do for them, I have found a great glove at a reasonable price point. I had been using the Taylormade Targa Tour glove for some time and really loved its performance and long-lasting wear time. Unfortunately the time came when I just couldn’t find it any more, so had to make a choice on a new glove. 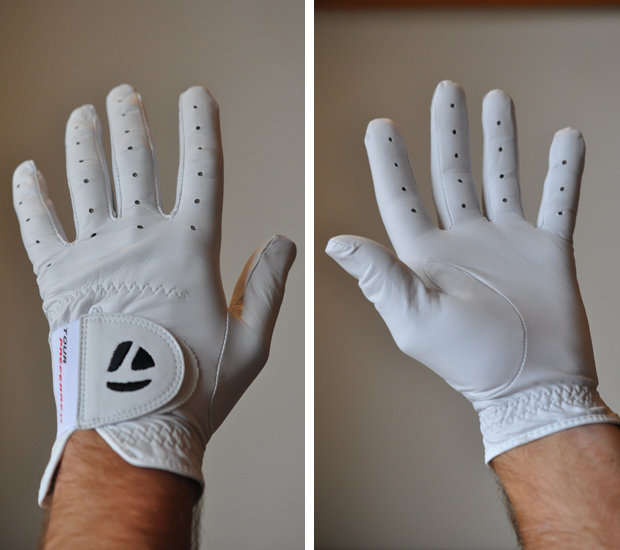 Sticking with Taylormade I decided to try out the new tour model; the Taylormade Tour Preferred glove. It features AAA Cabretta leather for that soft feel, a new stretch fit closure system and a moisture wicking wrist band. The glove is quite different to my previous model with larger breathing holes on the fingers and no smaller perforations over the palm and back of the hand. The first notable thing about this glove is that it fits really well. Maybe a little tighter out of the box than the previous model but it will stretch out a little bit. Sizing is still the same for me. The leather is high quality and has that supple feel. The closure system is no doubt an upgrade. It has an elastic stretch section which really allows you to find the right feel. With a large velcro patch this glove will wear well and always provide a comfortable fit. All in all your golf glove needs to perform well in a range of temperatures and conditions. You should always choose one that you like the feel of and that functions just the way you like. This glove is definitely a high-end glove and performs just the way I like my gloves to. Website: Taylormade (note this is the US website as the AU site does not list the TP Glove). Gardiners Run golf course is one of the newest additions to the Yarra Valley. Located in Lilydale off Victoria Road, this course has been built to replace the Chirnside Park course and continue to serve the local community for all of their golfing needs. I must start by saying that I had one of my most enjoyable rounds this year. As mentioned, the course is new and only opened in May 2014. That’s just three months ago. Like all new courses in mid-winter, the lies are a bit bare, the fairways don’t quite soak up the water as well as they will and the green surroundings are a little patchy. I was surprised that these blemishes were minimal and the course is still very, very playable. I always think that if you’re building a new course then the greens have to be right. The greens here are in amazing condition and roll perfectly and the guarding bunkers are interesting and also in good condition. I think the course designers have done an awesome job here, creating a real members course. All too often clubs are forced to move for financial reasons and end up building an overly demanding course. Here they have created a challenging but playable course with generous fairway landing areas. This is not to say it is easy, there are some very difficult holes that play long with wind but all in all just the right balance of short and long pars fours and fives. I really enjoyed all of the par threes. They were varied and look amazing, featuring water carries and well guarded greens. This course has quite a bit of growing-in to do but this will only help to make it a better course. I would definitely recommend a game here. Really is a refreshing and exciting experience. Here are a few of my favourite holes. The 1st: A 365 meter par four. What a fantastic opening hole. Long slightly dog-legging right to an elevated green. You need to hit a good drive and avoid the fairway bunkers left and right. The smart play is to leave it in the middle of the fairway and play a mid to short iron into the green. Once on the green putting is fairly straight forward as the green is quite flat. The 3rd: A 157 meter par three. A very pretty hole which requires a water carry to a long thin green. Play for the middle and try to make your putt from there. Sure to be a favourite. The 11th: A 166 meter par three. A tough little one that requires a good tee shot to a guarded green. The play here is to err on the long side, as you will find less trouble here. The 18th: A 388 meter tough par four. What an amazing finishing hole. You drive the ball up the shute avoiding the fairway bunker on the right. A good drive will leave you with a mid iron to the green which is surrounded by water on three sides and a bunker short left. Go for the center or be brave and hit at the pin but miss and you will pay the price. Gardiners Run Golf Club have got everything spot on here. The course is amazing and will only get better, the staff in the pro shop and bar were very friendly and welcoming and the clubrooms are perfect. You really must come for a game here, it will not disappoint. I personally can not wait to come back. Well, it’s been a long time coming. Finally we have another world number 1! Adam probably doesn’t feel it’s a massive thing given he’s been around the top ten since 2004. Then again, maybe he feels like I’m sure every Australian who love the game – unbelievably awesome! Well done Adam! It has been such a long time since Norman held the spot and I’m sure the whole nation of golfers here in Australia have the same grin I do tonight. Send Adam a congratulations here at the PGA Australia website. Golf Blog Australia wishes you all the best in holding the spot and a great year ahead for Australian golf. What an inspiration. Just what the up-and-coming juniors and golf in general in Australia love to see. A world number 1! Well, today was the start of something new – a lesson in golf. I know that this is not ground breaking by any means though for me it was a big step. I guess the thought of someone critically looking at your swing and trying to change it is a bit scary. I decided to go and see Tim Wood. He works out of a few clubs including my home course (Heidelberg Golf Club). Some background about me and my game…I’ve never had a lesson and despite reading a lot about golf swings and watching footage of lots of swings I haven’t really seen my swing much. The lesson was a real surprise. Tim came over, watched me hit some balls and started feeding me compliments on my swing which immediately made me relax and probably more receptive to his ideas (thanks Tim!). After filming my swing on his tablet he went about showing me what I could work on. I found this very interesting due to the fact that his suggestions were things my good friends, many of whom are great golfers, have never seen or suggested. Tim spent a lot of time talking to me about the game and I think he was really trying to understand what I was thinking. After some more discussion he asked me to hit a few shots with different shape and watched what I was doing. I think the great thing about the lesson was that it really was good to discuss and ask questions of someone who is completely impartial. In a nutshell, I really believe that this might have been the best money I’ve ever spent on golf. I walked away not with a completely de constructed swing but a stronger resolve that I can work things out and I’m on the right path. Here’s the tip that worked for me; when practising, spend half your time working on the technical stuff and just forget about the results. The next half of practice should be spent on working shots around and really trying to get a feel for the shots. This practise should emulate a game. For the next few weeks I will be working on a drill he gave me. It’s called the Nine Ball Drill. You hit a draw, straight and fade low. Then hit them mid height and then a high draw, straight and fade. If you’re afraid of getting a lesson, don’t be. You do need to be open to suggestions and be willing to make some improvements but I’d recommend a lesson any time. Stay tuned to Golf Blog Australia for more about my journey. I was so impressed that I’ll be back for another lesson next week! Welcome to Golf Blog Australia. I’m Luke. A school teacher with a passion for sport, in particular golf. My home course is Heidelberg Golf Club where I play off a reasonable handicap which sits somewhere around 10. As I’m sure is the case with many golf enthusiasts, I was hooked the moment I struck that first ball! Some of my fondest memories center around my early experiences with golf – playing with family, laughing at badly hit shots (which were more frequent than the good ones! ), or just spending time with my father and messing around with my two brothers. I still regard these early days as the real gems in my golfing life. My dad passed away several years ago though I still think about him every time I go for a hit. I even carry some of his old gear in my bag for good luck – I’m sure it will start working soon! I’ve been fortunate to have played some of Victoria’s best courses, including Kingston Heath, Moonah Links, Metropolitan, Huntingdale and many more. Over the years I have had many second-hand sets of clubs from Prosimmon to Titleist Blades and Taylormade Cavity Blades. I only just recently bought my first set of brand new clubs (more about them in My Bag). I have an unusual style, hitting all of my shots right handed and putting left! Yes, I know it’s strange but you should see me play tennis! I’ve always been able to strike the ball well but control is often a problem for me. I have a young family with two children under three. Time is not what it used to be. Practise and more than one game a week is difficult to manage but every now and then the wife unchains me and I get out. Being a teacher I’m also lucky to have school holiday time which usually allows me to string a few more rounds together. I often find my game improving in this time. This blog will chronicle my golf progress and experiences as I attempt to improve my game (maybe even get a lesson or two!) along with featuring equipment and course reviews, so feel free to stick around and follow along.